Springfield Armory has been releasing product after product, trying to create as many sales as possible, by reaching out to as many people as possible. This time around, Springfield seems to have gotten at least half of the equation right with the determination of the cartridge being used in the newest addition to their handgun family, but I do believe they missed the mark on their chosen platform. I've read a bunch of the comments, most of them unfavorable towards the belief that SA is announcing the release of yet another 10mm 1911. Most folks seem to want either an XD or XDM in the venerable cartridge. Still, Springfield has likely done a ton of market research into what people are asking for, and even if the Facebook comments don't show it, they followed what their research shows. The pistol itself, chambered in 10mm, comes with either a five or six inch barrel, and is built using a stainless steal slide and frame. The safety is one that folks with either dominant hand can use, and comes tuned up with a 4.5-5 pound trigger pull. The press release says that this is a soft-shooting 10mm pistol with the all-stainless construction weighing in at 40 and 45 ounces, respectively, and each one ships with two 8-round magazines. Those purdy grips are the VZ G10, and each gun ships with Springfield's Black-T self-lubricating, corrosion-resistant finish. Helping you get on target are 3-dot tritium sights, with the 6-inch gun being fully adjustable. Finally, you'll also notice the rail for all of you weapon mounted light lovers out there. Price? Well, MSRP is $1790 for the five inch, and $1842 for the six inch model. This isn't a gun the average 1911 enthusiast will be able to afford, which is a shame, because I'm average and would love a 10mm option. What about you? 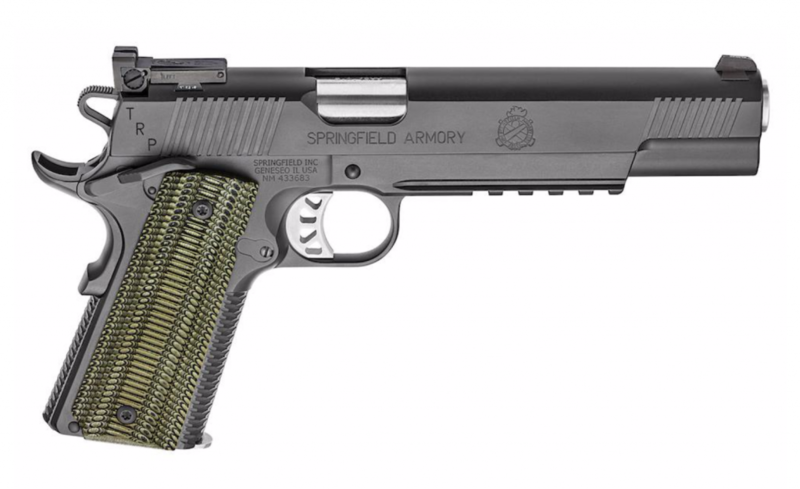 What do you think about Springfield Armory‘s latest offering? Is it a pistol you've been waiting for? Or, were you looking for something else from them altogether? Let me know in the comments, and be sure to share and bookmark this article.